Bench grinders often get overlooked when it comes to useful power tools to own. That is kind of strange because they actually have a lot more uses than the usual power tools that people own like circular saws and reciprocating saws. A bench grinder can do so many things with a piece of metal. It can polish, shape, clean, grind and sharpen. Without a doubt the best bench grinders are an incredibly important and versatile power tool to have in your workshop. Here is a quick look at some of the best bench grinder models you can buy. We will take a much more detailed look at these models after the buying guide. What Model Bench Grinder Would We Choose Out Of Those We Reviewed? Here are the important characteristics of bench grinders to consider when shopping for a new one. Grinders are like most power tools because they come in all different qualities and price ranges. That is why use must consider how well a particular model bench grinder fits into your budget. It is never a bad idea to set yourself a budget range when shopping for a tool like a bench grinder. Setting a price range to shop in will not only help you stay on budget but it will also narrow down your bench grinder choices so you don’t waste time looking at models you will never buy. One big thing to consider when setting your budget range is the frequency you will use your bench grinder model. If you will be doing many different tasks with it on a regular basis then it is easy to justify spending a little more on one of these handy power tools. If you won’t be using it a lot there are plenty of budget models available that will do the job nicely. You really need to also consider how powerful you want your bench grinder to be. Some grinding tasks require the grinding wheels to spin at very high RPM’s. So this is something to seriously consider if you will be shaping metals or doing some serious grinding down of metals on a regular basis. The higher the RPM’s a bench grinder has the better it will be at doing the heavier duty grinding tasks that you require. If used improperly a bench grinder has the potential to cause serious injuries. Most manufacturers go to great lengths to add safety devices to their grinders that will greatly reduce the risk of injury when using them. There is no way you can grind any type of metal in a way that it won’t create sparks. Since sparks are basically super-heated small chunks of metal they are not something that you want flying all over the place. That is why a good properly installed spark deflector is an essential piece of safety equipment. These are usually small pieces of flat metal that are installed closed to the top portion of the exposed grinding wheel. As you grind the centripetal force created by the grinding wheel tends to pull the sparks all the way around it as it moves. The spark deflector angles the sparks that hit it in a downward fashion so they do not go back toward the tools user. Out of safety concerns over the year’s bench grinder manufacturers have come up with ways to make using bench grinders much safer. One of the most innovative pieces of safety equipment that is almost standard equipment now on most model grinders is a plastic eye shield. These are located at the top portion of a bench grinder and placed in a way that metal fragments from grinding will have a hard to shooting upward toward a user’s face. Wheel guards are pieces of heavy plastic or metal that covers the exposed bottom of a grinding wheel. These are put in place so you don’t accidentally catch your clothing and have you pulled toward the speeding grinding wheel and to keep your body parts from accidentally coming into contact with the rotating abrasive grinding wheel as you are using it. Most bench grinders come with both a coarse and fine grinding wheel. There are other types of grinding wheels such as ones that are made of steel brishes for cleaning and polishing. 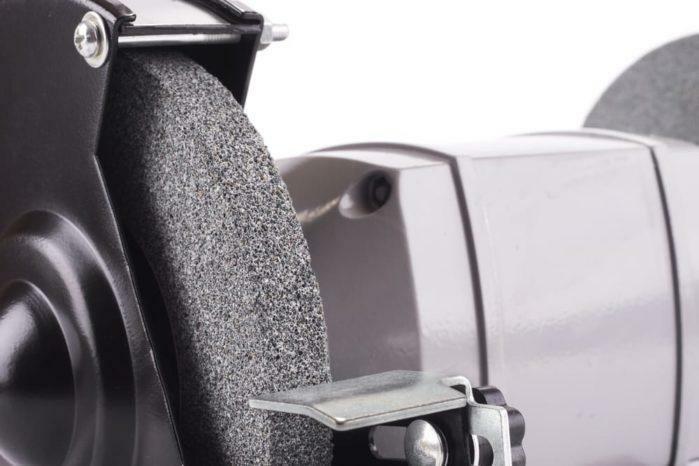 A model bench grinder that makes it easy to change out grinding wheels can be very convenient to own. You also have different size grinding wheels that bench grinder products come with. Keep in mind that you can’t interchange wheel sizes on a bench grinder model so be wary of that when making your selection. Bench grinders generally come with 6, 8 or 10 inch grinding wheels. Smaller grinding wheels are better for precision grinding tasks and polishing. Large grinding wheels are best for heavy duty grinding tasks. Your hands tend to get pretty tired if you have a lot of grinding to do. That is where an adjustable tool rest comes in very handy. They will really help to cut down on arm and hand fatigue as you are working. Get as long and as inclusive a warranty as you can get with your bench grinder purchase. This is especially true if you spend the money on a more expensive model. A good warranty is a nice peace of mind to have with any power tool purchase. We mentioned that bench grinders are a very versatile power tool. Al that versatility will not do you much good though if you are not familiar with the many different ways you can use your bench grinder. If you are truly looking for a top of the line model bench grinder then you don’t have to look much further than this model. With it you can do many different grinding and polishing tasks and do them well. It is an elite model bench grinder that will not look out of place even in a professional tools shop. This high quality bench grinder is loaded with features. It has many built in safety devices and handy dual tool rests on each side of the machine. It will generate 3600 RPM’s for you to work with too. That is easily enough power to grind, polish or shape any type of metal. This is one tough grinder that is built to last also. It has a strong motor casing and a solid cast iron base. It is nicely backed up by the manufacturer with a 3 year warranty. 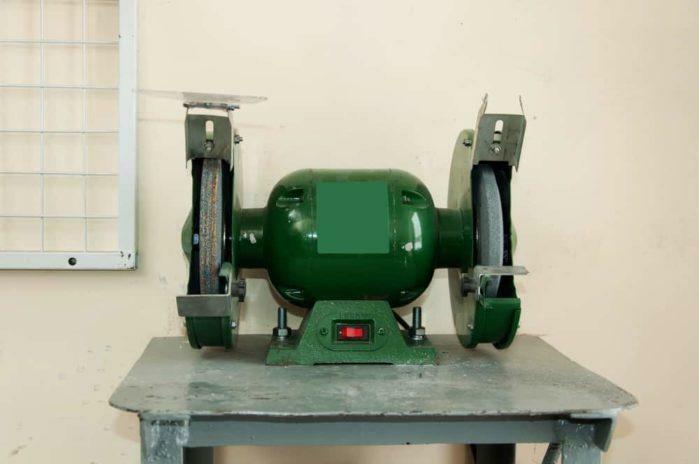 One other nice quality about this model grinder is that it is built to fully comply with OSHA standards. DeWALT is a trusted name when it comes to power tools and products like this model bench grinder are the main reason why. 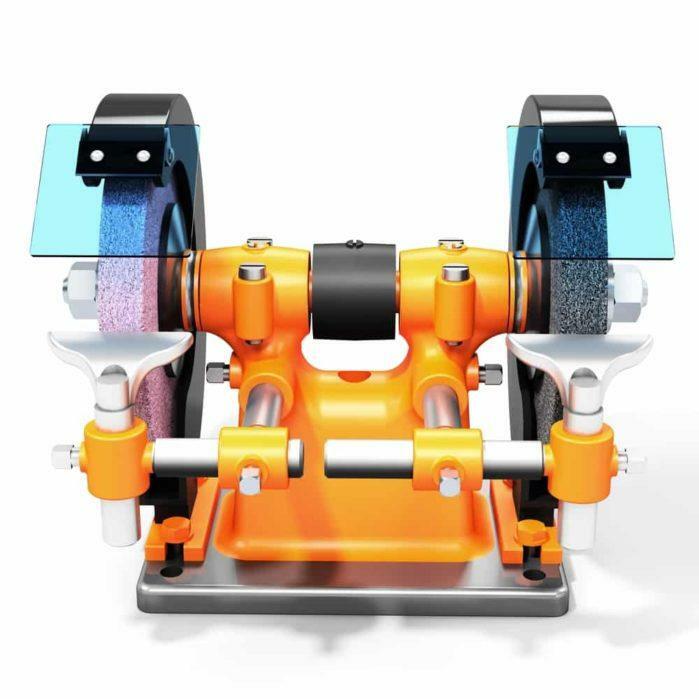 It has many innovative features built into it and enough power to handle any bench grinding task. We really like the way this bench grinder is put together. It features a very good motor that generates a consistent 3450 working RPM’s. This model grinder also has safety features such as eye shields, spark deflectors and wheel guards built right into it. The rear exhaust ports are a very innovative addition to this model grinder too.This model bench grinder should also last you a long time. It has a very solid cast iron base and the motor housing is built using cast iron too. This model grinder from DeWALT comes with a three year parts warranty and one year service warranty. This is the only eight inch bench grinder on our top review list but it’s a very good product. Sunex was very creative when they designed this model grinder and it includes everything you need in this versatile power tool. It will enable you to grind, polish, clean and do a whole host of other metal working chores too. You get a very generous 3450 RPM’s of working power with this model bench grinder. IT also includes many safety features and multi-positional tool rests. The flexible attached work light is a very innovative and helpful feature too. This model bench grinder comes with larger 8 inch grinding wheels. It is a bench grinder that is built to last too. It features a sturdy cast iron base that includes pre-drilled mounting holes and rubber feet. The motor casing is also made of tough metal alloy construction to help it handle heat buildup when using this grinder. Wen Tool Company is fast becoming one of the leading manufacturers of affordable power tools. This bench grinder model will give you a lot of bang for your buck. It has many features that you would expect to find on a much more expensive model. It can easily handle just about any bench grinder task. At 3450 RPM’s it is well suited to do all but heavy grinding tasks. Wen added on many safety features to this product and even included a built-in work light. Go easy with how much weight you place on the tool rests because they are not the sturdiest ones we have seen. This model bench grinder is surprisingly light and easy to move as it weighs a little over 16 pounds. It is a great model for those that need a mobile bench grinder for their service work. This is an affordable and goo working model bench grinder. SKIL put many innovative features into considering what an affordable model it is. You will have no problem do many different polishing, grinding and metal shaping tasks with it. It’s a very efficient bench grinder model. It is the perfect power tool to have around your workshop to do metal cleaning, polishing and light grinding tasks with. The tool rests are fairly solid and you can make some adjustments to them also to meet your working needs. This model bench grinder has many built-in safety features and comes with both course and medium grinding wheels. The LED work lights are a very innovative feature to have but many customers seem to feel they burn out too soon. This model bench grinder is priced super affordably for all that you get with it. Its cast iron base provides a solid base in which to do your grinding work on. No real deal breakers were noticed with this product though. Which model do we like the best? We would have to go with t﻿﻿he DeWALT DW756 6-Inch Bench Grinder. The reason why is because when you consider its cost and how well it works it means that anybody can have a quality bench grinder in their workshop. This model grinder is built tough with its cast iron base and motor casing. It has enough power to do any grinding task you ask of it too. DeWALT has also added in some very nice safety features with this model. What sets this model apart from the other grinders is some of the custom features it has. Things such as the rear exhaust port and precision made tool rests make it a step above the other models in quality. If you are looking for an excellent and affordable bench grinder model you would do well to at least consider this product. It truly is among the best bench grinders you can buy.